These days, the conversation seems to be all about (mobile) apps: Facebook (Messenger, Whatsapp), Instagram, Youtube, Snapchat, Pinterest, Twitter, etc. Why would you need a website if you have an active presence and entertain a vibrant community on all those services? Isn’t a Facebook page or a Youtube channel sufficient to connect with your audience? What’s the specific purpose of a website in your marketing toolbox? Let’s put it simply: your website should be the focal point of your strategy, the everlasting property which sits at the very centre of all your online efforts. Here are 7 reasons why you need a website to help your business succeed both on & offline. Architecting your website is the utmost creative exercise. When you’re faced with the task of briefing an agency to create your website or when you embark on designing it yourself, the first step is always to articulate your thoughts on plain old paper: what is your USP (unique selling point), how do you want to introduce your services in a few key concepts, what differentiates you from your competitors? What will be the main KPIs (key performance indicators) of your website? Direct sales or inquiries / lead generation? What will you offer in exchange for your users attention? Which calls-to-actions will lead visitors to sign up as prospects or clients? All of those questions will help you refine your strategy, which will be embodied by the architecture of your professional website, fully designed to serve your business purposes. It’s essential for most businesses to entertain an engaging social presence. Facebook has over 1.5B monthly active users, Instagram more than 500m, Youtube has replaced TV for most youngsters. It’s also the #1 destination for tutorials. It would be stupid not to hang out where most people are spending their time. As if major brands would avoid the High Street, hoping for unlikely footfall in the middle of nowhere. Nevertheless, due to the nature of their time-sensitive / feed-oriented user experience, most of those platforms lack a sense of persistence, which is crucial to establish a sustainable relationship with your audience. Don’t get me wrong, realtime storytelling is amazing, it gives you an unprecedented vibrant connection with the narrator. But sometimes you just want to step back and explore content in a more holistic way, disconnected from the here-and-now, which isn’t really what most of those apps excel at (except maybe Youtube, albeit limited to videos). While I strongly advise you to piggyback on successful platforms to raise awareness around your offering and build a community where people are hanging out, I should also warn you against relying exclusively on those outlets to connect with your audience. They frequently change their display algorithms, which can have an overnight negative impact on your reach. They can also modify their terms of services and ban in a snap some of your most efficient marketing tactics. Smaller startups frequently sell (out) to larger ones or simply go out of business. You don’t want to be at the mercy of third parties, see your user base vanish or become unreachable without prior notice. Your own website easily enables you to collect email addresses and run a newsletter, set up various pixels (Facebook, Google,…) to retarget your visitors on the internet highways, present your brand and content as you please. It’s your very own property on the open web. As long as you renew your domain registration in time, pay your hosting fees and abide by the law, it will always stay open for business. Prospects and clients tend to ask very similar questions all over again. Your website, with the help of tools like Uservoice or the right WordPress plugins (+ on-site chat tools, incl. messaging apps), is the perfect place to offer a well stocked knowledge base answering most FAQ. Your blog, easily set up using tools like WordPress, Wix, Squarespace or Weebly, can also become a great resource for inspiration and proactive support. Never be too salesy: users expect you to offer them value before allowing you to grab their attention. If properly structured, all the unique content you will share on your own website will contribue to your domain’s SEO, which will bring you additional – free – organic traffic. You can run native lead generation campaigns on Facebook or Twitter but it doesn’t come cheap and the data you can collect is pretty limited. If you want to roll out a proper lead generation strategy, you should use on your website advanced form builders like Typeform (my #1 choice), Wufoo, Gravity Form or the amazing Formcraft plugin for WordPress (and promote your lead generation campaigns where appropriate, incl. Facebook and Google). The data you will collect can be pushed in real time to any CRM using Zapier. You can try out distinct calls-to-actions on different pages of your website and track the efficiency of each variation. Your website allows you to fine-tune the context around the lead capture experience, which increases conversions. You can even use a tool like Optimizely to A/B test different versions of the same page. After years of app frenzy, consumers’ app fatigue is now a real issue for developers. Casual people (i.e. not the Silicon Valley crowd) don’t download new apps any more. They spend most of their time in a handful of applications, led by Facebook & co (Messenger, Whatsapp), Instagram, Snapchat, Youtube and the other Top 50 players (with a high turnover of gaming titles). Native apps are THE unicorn / winner-takes-it-all business. Besides spending a lot of money on app development, you’re now forced to spend even more on user acquisition (and retention) to compete in this cut-throat market. It is much cheaper to attract and retain users on the open web, where your content is always one click/tap away, without the need for your users to authenticate or download anything (browsers are ubiquitous both on desktop & mobile). Helped by the advances of artificial intelligence, popular messaging apps will increasingly become a new discovery channel for web content, along Google and other search methods, including connected devices like Amazon Alexa. A mobile-friendly responsive website is the best future-proof investment you can make. The raw data stored in your website’s database will be actionable via a plethora of connected devices while the responsiveness of your layout will make sure your content is properly rendered on all the screens used today and the ones still to come. For all those reasons and many more specific to your own trade, I strongly advise you to dedicate time and efforts in a quality website, the absolute kernel of your online marketing strategy. I can help you craft and promote your online property. 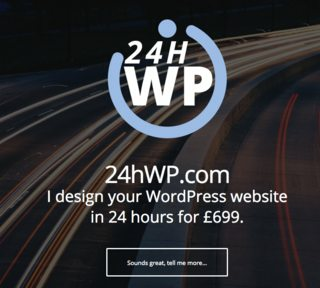 See the bespoke service I’m offering on 24hWP.com. Its a shame that so many businesses are not seeing the benefits of responsive websites.